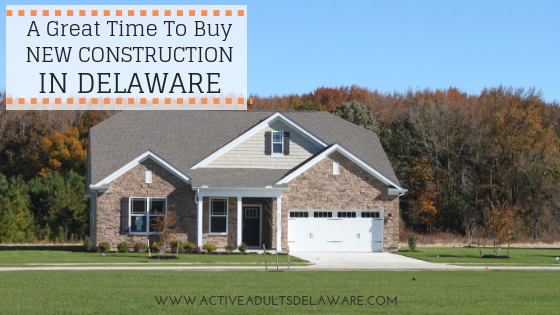 Wherever you go in many parts of Delaware, you’ll see signs of new home communities with heavy equipment moving dirt. Drive back in a few weeks, and model homes are dotting the landscape but so often they all look alike. As REALTORS®, we always take note of these new communities but every so often the news is exciting. One of those is the new K. Hovnanian Four Seasons at Belle Terre. The Four Seasons brand from K. Hovnanian is well known in the Mid-Atlantic Region for good reason. They have their finger on the pulse of what the true active adult is looking for. Check our Neighborhood Page on Four Seasons Belle Terre for regular updates, contact your Active Adults Realty agent for more information and let us know if you can make it on November 17thto get details and see the models under construction. Woodfield Preserve, the new D. R. Horton community on Broadkill Road, Milton, Delaware, is another new community worthy of your attention. It offers a great location just 6 miles north of Lewes, only 5 minutes from Broadkill Beach, next door to the popular Rookery South golf course and the clubhouse is already under construction. We have become accustomed to waiting a year or more for the clubhouse and other amenities to be open, so this is a welcome change. This might be the community for you if you don’t want to wait 6 – 18 months for your new home to be built. We are updating the Woodfield Preserve neighborhood page with new information now or call your Active Adults Realty agent for all the details. D.R. Horton’s pricing in the Mid $300s to the Low $400s is “All-In” pricing and reflects the actual price you will pay for the home you see. This is in contrast to “Base Model” pricing which does not include options and upgrades that you will select during your Design Center meeting. When complete, this community will include 253 homes. Also, this month, we learned of the new Residences at Rehoboth Bay, an exciting new Condo Community coming soon. Located overlooking Love Creek outside Lewes, Delaware, six buildings of 30 units each are now being built next to an existing marina at the Love Creek Bridge. Each building will have an elevator! If only the condo buildings in the Village of Five Points had elevators, but sadly they do not. You will be able to choose from two-bedroom units starting in the low $200s or three-bedroom units in a gated community with a pool, pool house, and boat slips available. We are waiting on final pricing, but if this sounds good to you, please contact your Active Adults Realty agent quickly. This condo community is filling a huge need and I know they will go quickly. If you are looking for the latest Delaware community information as well as what local life is like here in Delaware, then you would benefit by subscribing to our monthly Boomers and Beyond in Delaware newsletter. You’ll receive the latest news about Delaware’s new home communities and all the great things you can see and do when you retire in Delaware. Sign up here!